There are a lot of terms and phrases used in the world of software testing. From a wide range of different testing methods, to a variety of metrics, and the many components that make up a software test, it can be hard to remember exactly what each term means. We like to keep things simple at TestLodge and just focus on the core components of testing. Take for example “Test Cases” and “Test Scenarios”; what’s the difference? In short, a Test Scenario is what to be tested and a Test Case is how to be tested. In other words, a test scenario is a collection of test cases. 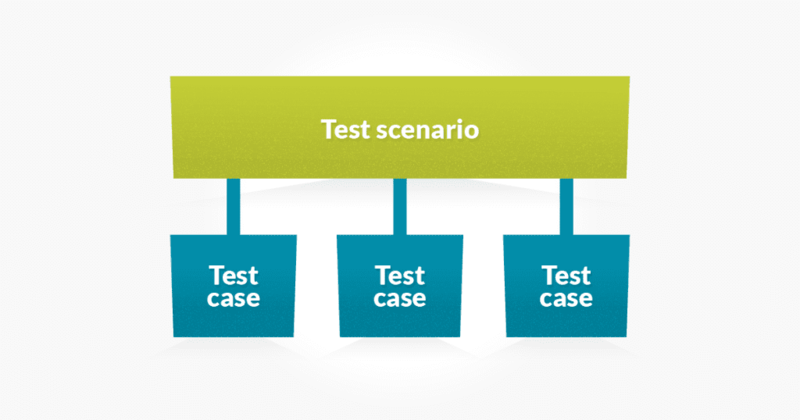 Lets take a closer look at the difference between a test case and a test scenario. The purpose of scenario testing is to test the end-to-end functionality of a software application, to ensure the business processes and flows are functioning as needed. In scenario testing, the tester puts themselves in the users shoes and determines real world scenarios (use-cases) that can be performed. Once these test scenarios are determined, test cases can be written for each scenario. Test scenarios are the high level concept of what to test. A test case is a set of steps to be executed by the tester in order to validate the scenario. Whereas test scenarios are derived from use-cases, test cases are derived and written from the test scenarios. A test scenario usually has multiple test cases associated with it, because test cases lay out the low-level details on how to test the scenario. If you want to separate each Test Scenario in TestLodge, you can use the Test Suites section. In this case, you would create a new Test Suite and include each Scenarios case in it. This allows you to group test cases on a per-scenario basis. So, using the example above, the Test Suite would be “Validate the login page”, and each Test Case would live under it. Both test cases and test scenarios are major components in software testing. While they are closely related, both have advantages and disadvantages. For example, the extreme level of detail in test cases is important when working with testers off-site, but in a time-sensitive situation where you may not have time to write detailed test cases, a test scenario may be sufficient. Using both test scenarios and test cases together will ensure a robust, high-coverage testing initiative. Try TestLodge test case management now to see how you can organize your Test Cases and Test Scenarios.